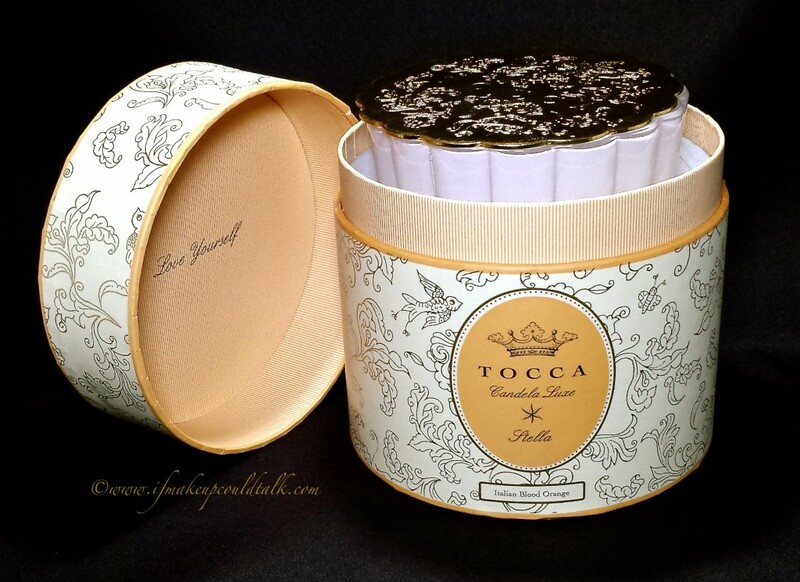 Tocca Stella Candela Luxe Collection Will Capture all of Your Senses. For the most part this blog focuses on makeup, but as a self-proclaimed lover of all things beauty related, I find it an absolute duty to feature products outside the realm of cosmetics that bring me just as much joy. Today’s object of affection centers around an item of true beauty–Tocca Stella Candela Luxe Collection ($54 USD/ 287g). This exquisitely packaged candle not only looks intoxicating, but the emitted scent is sure to capture all of your senses. I hope you enjoy. Stella is house in a sturdy cardboard canister that has the most uplifting message scribed under the top: LOVE YOURSELF. The same inspiring message is etched under the metal top that sits directly on top of the candle. The metal top is quite substantial and thoughtfully scalloped at the edges to fit the glass perfectly. This metal disc adds a certain glistening charm to the base of the glass when the candle is lit in the evening. 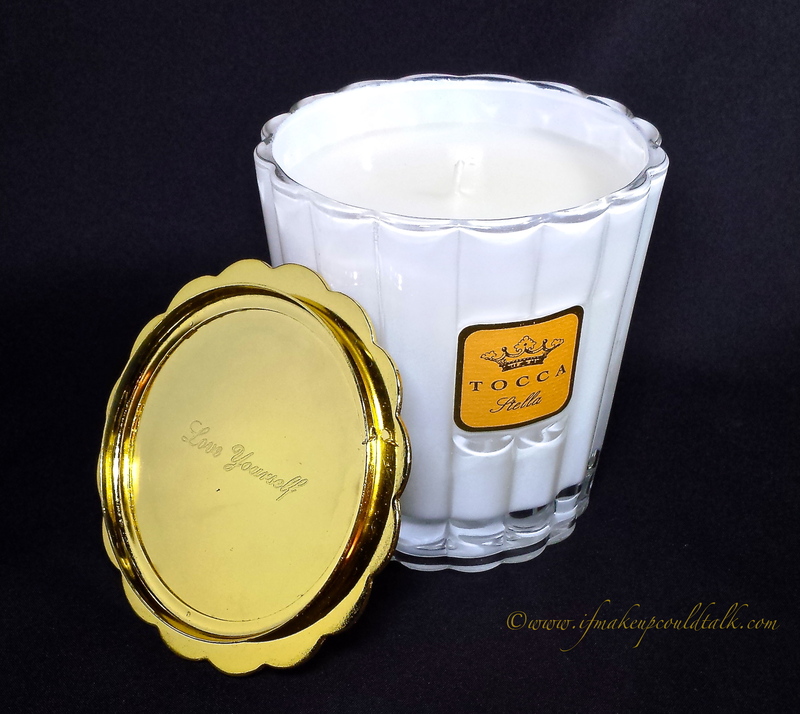 The heavy frosted scalloped glass holder is not only unbelievable sturdy, but attractive. 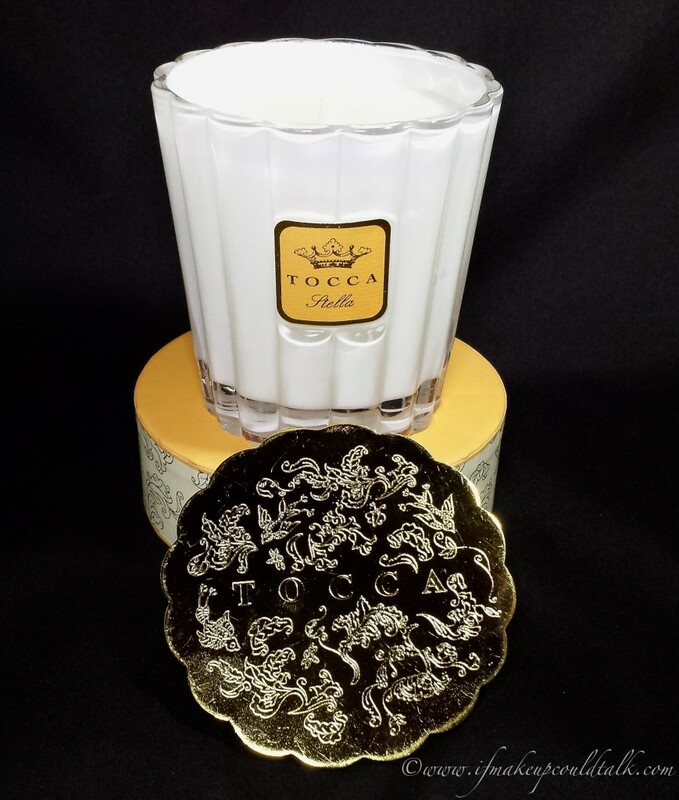 Unlike some higher-end candles in this price range, that are composed of simple glass designs, Tocca (which means touch in Italian) looks and feels unique and elegant. This is not the type of container one thoughtlessly discards after the candle is consumed. I can completely envision using the empty glass container as a vase for some roses, or a holder for my makeup brushes, or even as a decorative pen holder for my desk–the possibilities are endless. The beautifully fragrant scent of Italian Blood Oranges is quite powerful even before lighting the candle. This is not the type of candle that should burn for hours on end. On the contrary, I find in just 20 minutes the air is infused with the most complex notes of Bitter Orange and Blood Orange and White Freesia. According to the perfume version of Stella, the other middle and bottom notes consist of Wild Diamond Orchids, Spicy Lily, Sheer Musk, and Sandalwood. Of course burning time is a very personal preference. Some people may enjoy a more robust aroma, which is achieved with a longer burning time. Personally, I prefer the outcome of a shorter burning time which produces a subtle lingering fragrance. This is also the type of candle that burns slowly and evenly. **Update: After burning the candle for a month, a dip in the center has developed, however the candle does indeed evaporate slowly. ** In one instance, I did burn Stella for an hour straight and it seemed as if the wax barely evaporated. 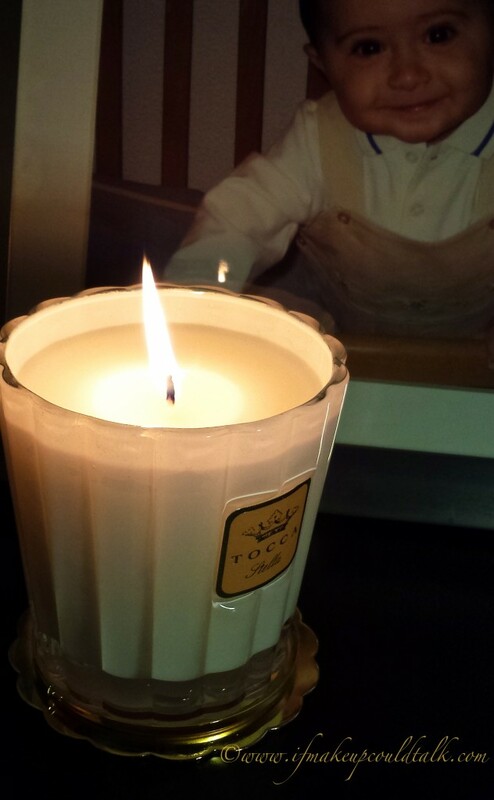 Frankly, I cannot foresee finishing this candle anytime soon. Currently, Stella sits comfortably on my dresser. I find the hypnotizing dancing flame coupled with the rich intoxicating aroma, relaxes me after a long day. Not to mention, the fragrance makes my bedroom smell amazing the day after. 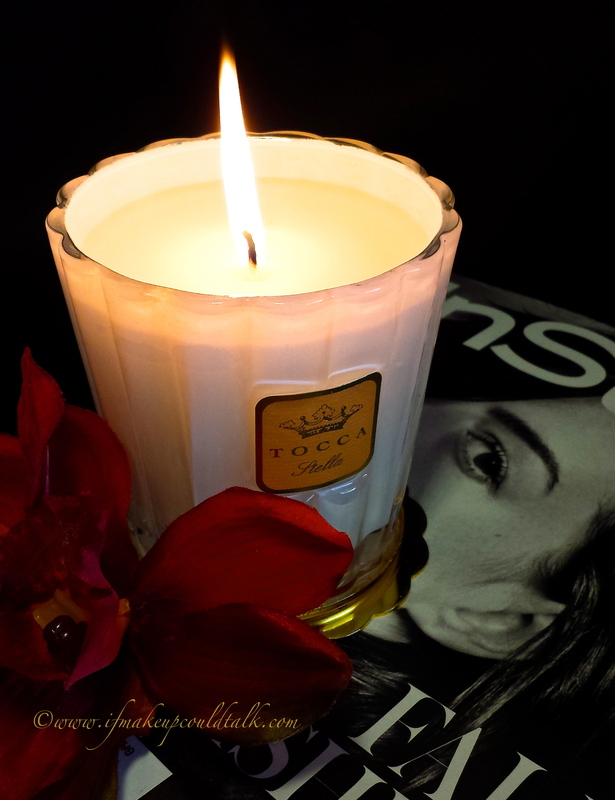 Tocca Candela Lux comes in four distinct fragrances: Cleopatra, Stella, Bianca, Giulietta. 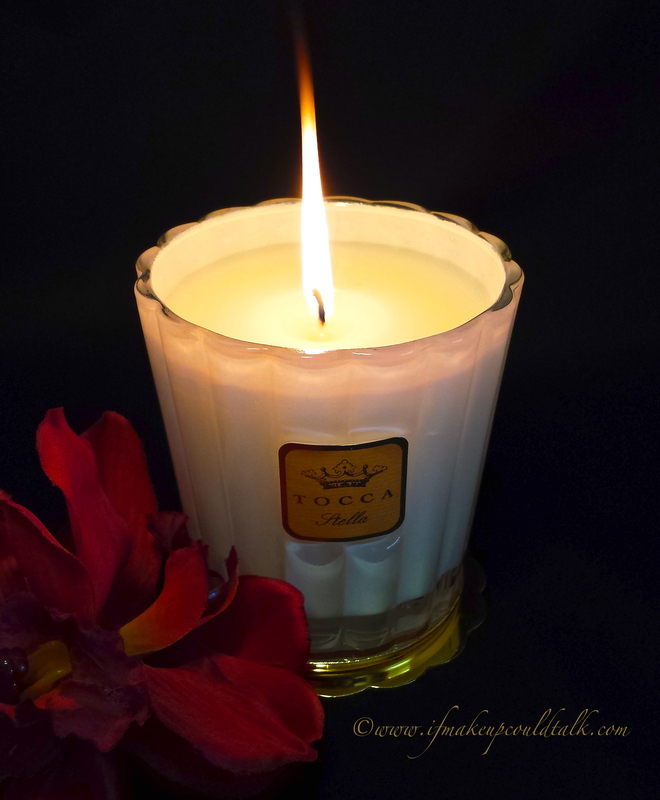 Makeup would tell you Tocca Stella Candela Lux is an exceptional piece of work. This Italian beauty is sure to captivate anyone. As Stella thoughtfully suggests, always love yourself, with a little “me time” by curling up with a good book, a cold beverage and of course, a quality candle. 🙂 Until next time, be well, stay safe and be happy.